On Dec. 4, Browning Investments and the City of Fishers announced a $157 million development for Fishers’ downtown, along both sides of 116th Street. A press release stated the mixed-use development would have residential, retail, a high-end boutique hotel and a six-story office building. The press release called the development an “industrial-style campus” that is bordered by the Nickel Plate Railroad, North Street, Maple Street and South Street. Browning and CRG Residential will develop the north side of the project which will feature a five-story apartment building with 241 units, 10 townhomes, and office and retail units on 116th, North and Maple streets. There also will be a public parking garage and will locate Fishers’ existing Pocket Park into a plaza gathering space. The development plans to preserve historic downtown buildings such as the Nickel Plate Bar and Grill, Roman and Leo, Fishers Barber Shop, the former Vardagen and Sure Shot Coffee store and the State Farm Insurance, but the plans are to renovate the landscaping and exteriors. 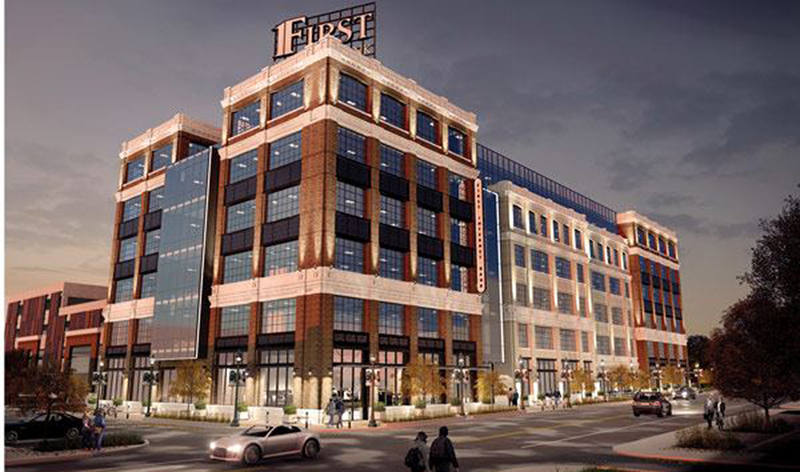 A six-story office building will anchor the south side of the development. The office building will be 168,000 square feet with retail space on the ground floor. A parking garage and a 110-room high-end, boutique hotel also will occupy the south side of the development. First Internet Bank, 11201 USA Parkway, plans to relocate to the planned office building. Construction is planned to begin next spring and is scheduled for completion in fall 2021. In addition to the development, there will be improvements to sidewalks and an extension of South Street from Fishers Point Boulevard to Lantern Road. There will be right-turn only lanes installed at South Street and Lantern Road and at Lantern Road and 116th Street. The city plans to propose support for the project at the Dec. 17 city council meeting. A 750-space parking garage is planned for the north side and a 256-space parking garage is planned for the south side. The public parking garages will have reserved parking from 7 a.m. to 6 p.m. Monday through Friday for tenants. Unreserved spaces also will be available.